Downtown, Seattle, Washington, United States of America The Sky Observatory is located at the 73rd floor of the Columbia Tower at the corner of 5th Avenue and Cherry Street. 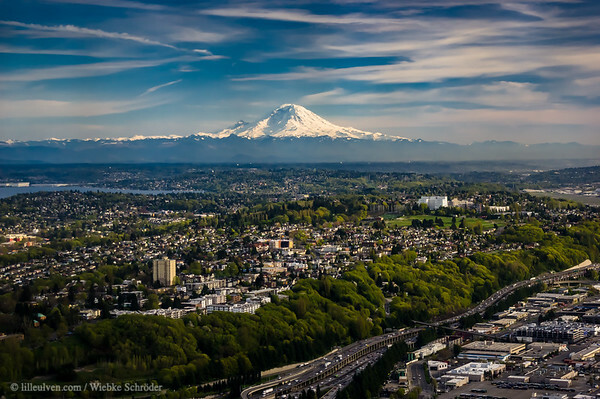 It offers a stunning view across Seattle toward both Mount Rainier National Park and Olympic National Park. With its 4392,168 meters above sea level, Mount Rainier is an icon as well as the most glaciated peak in the lower-48 of the U.S.A. uuid="84A62A94-3335-477A-A885-59A6D24E4619" id="United States of America lilleulven.com Mount_Rainer_from_the_Sky_Observatory_of_Seattle_United_States_Washington_Seattle_www.LilleUlven.com_20160406_180125.dng Pacific Northwest Lilleulven.com"